The CYO Chess program has been a welcome addition to the CYO. Schools and parishes have welcomed the program and witnessed positive experiences in their communities. Below you will find information on how to start a chess program in your school or parish community. But here are a what people are saying about the chess program. 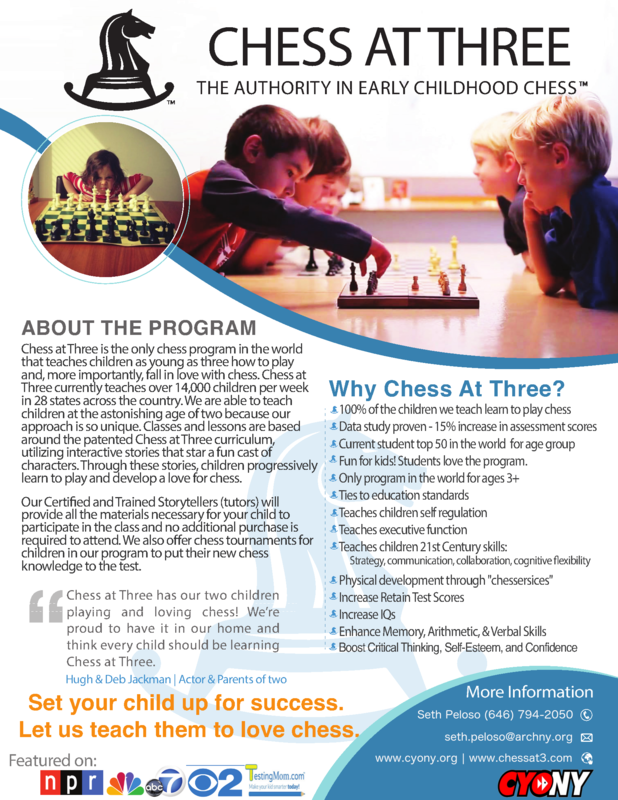 Chess at Three is the only chess program in the world that teaches children as young as three how to play and, more importantly, fall in love with chess. Chess at Three currently teaches over 14,000 children per week in 28 states across the country. We are able to teach children at the astonishing age of two because our approach is so unique. Classes and lessons are based around the patented Chess at Three curriculum, utilizing interactive stories that star a fun cast of characters. Through these stories, children progressively learn to play and develop a love for chess. Our Certified and Trained Storytellers (tutors) will provide all the materials necessary for your child to participate in the class and no additional purchase is required to attend. We also offer chess tournaments for children in our program to put their new chess knowledge to the test. Chess is the ultimate mental sport - it enhances one's ability to interact with other people and tests sportsmanship in a competitive environment. It shows that hard work is rewarded by success. The more effort one puts into chess, the higher the success rate. Chess shows that one learns from their mistakes. Every match begins with a handshake and ends with a handshake, teaching sportsmanship and respect in victory or defeat. 2) contact Seth Peloso to to confirm you interest. We will then place Chess Coaches at your school based on the needs of your school community you indicated. ANy school or parish looking to add new offerings in their community. Age groups can range from K - 8. It is recommended to try and form groups of children in grades K - 4 and 5 - 8, so the class can be structured for the appropraite ages. The cost for 1-hour instructional classes & play will be $10 per student/per session. Schools often set up between 8 – 12 sessions per school semester. *a minimum of 15 participants is needed to hold a class. 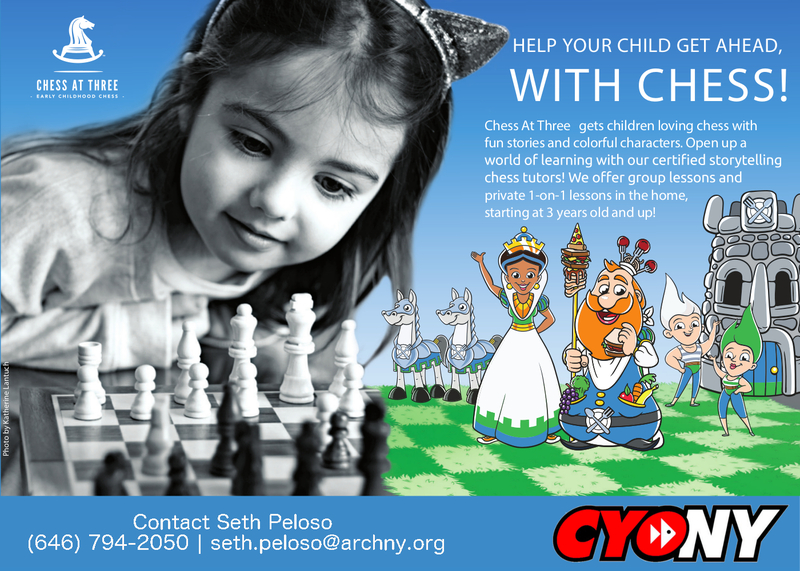 **CYO will subsidize a portion of the initial cost of the starter chess sets up to 10 sets. Option 1: School will be billed accordingly based on number of sessions and number of students. Option 2: Schools may collect individual payments made out to CYO and submit prior to the start of the first scheduled session. See sample registration form provided for your convenience. Feel free to use for your convenience. The day(s) of the week for instructors to attend. Every Chess At Three lesson has a fun story that introduces children to important themes that go far beyond chess. Chess At Three students learn about sportsmanship, grit, and math, all through stories.